Teil 5 erledigt! Oben im Eck seht ihr die Dreiecke, die ich aus den Resten genäht habe – konnte einfach nicht widerstehen, sie sind so süß! Part 5 done! Can you see the triangles in the corner? Could not resist to to sew it from the leftover scraps, they are so cute! Love the scrappy look 🙂 Merry Christmas and Happy Quilting! Your blocks are great!!! Thank you! 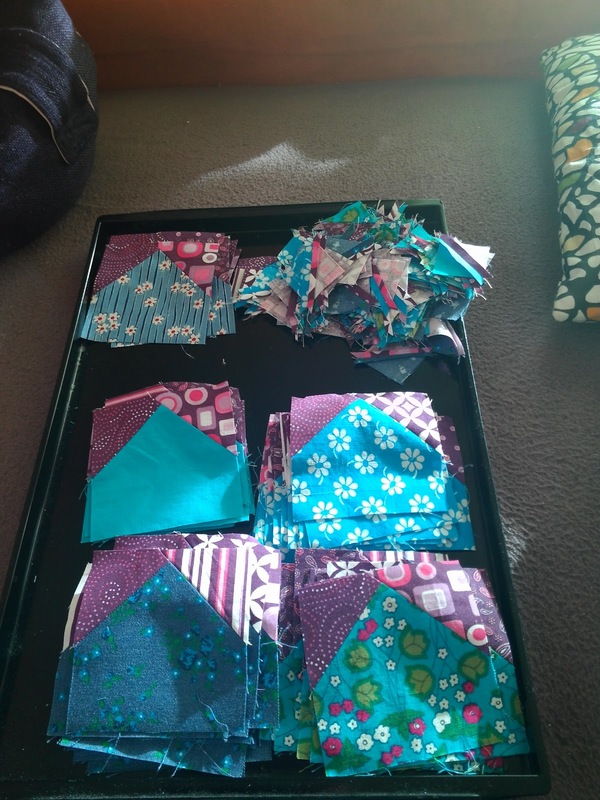 Now the final glue is online and I still can't imagine how the quilt looks my colors! Those bonus half square triangles are so cute! Merry Christmas. They look great! I am enjoying Easy Street too!